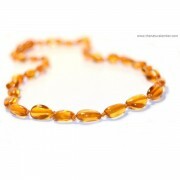 Amber Teething Necklaces There are 31 products. 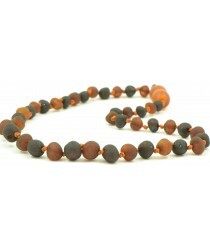 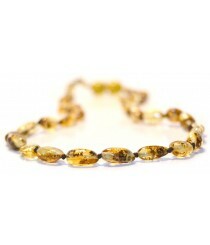 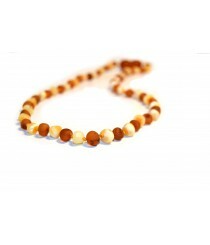 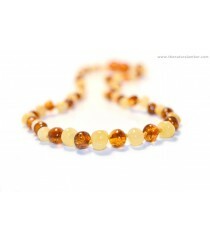 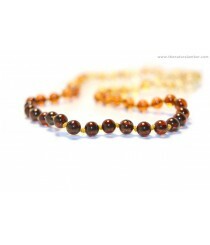 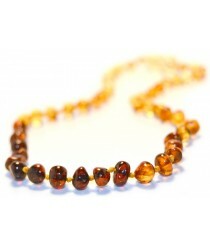 Necklaces made of Amber are becoming extremely popular natural remedy for teething babies. 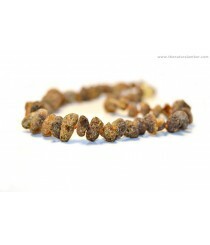 It is thought that Baltic Amber beads can release Succinic Acid when they are close to the skin for a long time. 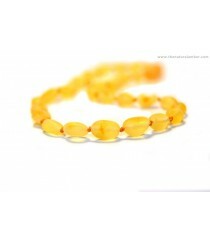 This acid is what provides babies with analgesic properties. 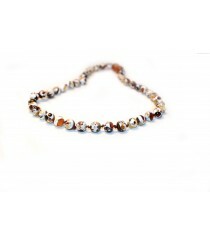 - Our baby necklaces come in many different colors and a couple of styles like baroque, raw baroque, bean (olive), raw bean (olive), chips and others. 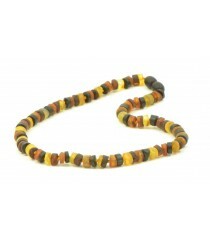 - Color choice for necklaces vary from cognac, dark green to lemon, honey, milky and others. 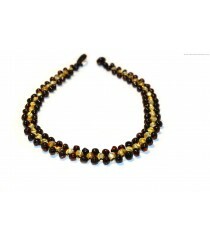 - Our product asortment for baby necklaces consist of more than 100 unique designs. 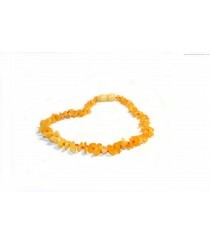 - To maximize safety of our necklaces all beads are knotted in between each other and also two types of plastic clasps can be chosen (Screw or POP). 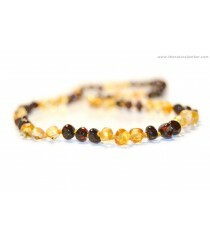 - We only use genuine Baltic Amber to make these necklaces so babies can get maximum pain relief while wearing them. 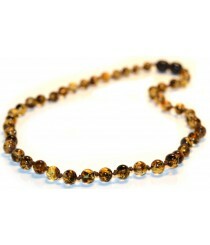 - Minimum order quantity for wholesale clients is only 10 baby necklaces for each style and color. 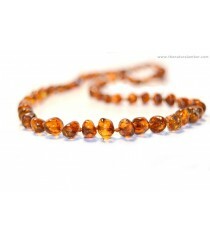 - In case you want to order Amber Teething Necklaces from us or want to know their prices simply contact us via e-mail info@thenaturalamber.com and we will send our catalogs with prices shortly. 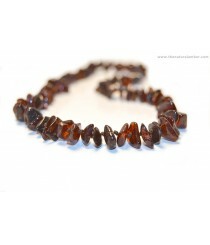 Product ID: B17; Style: Plaited Amber Baby Necklace; Length: ~32 cm (12,6 inches); Since this necklace is hand-made each time the design might be a bit different. 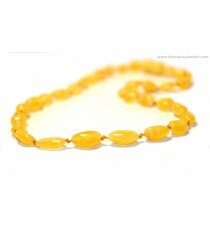 Product ID: B18-1S; Standard Length: ~32 cm (12.6 inches); Clasp: It is possible to choose either Pop or Screw Clasps; Average Weight: ~6 g; This necklace has a very special and unique design. 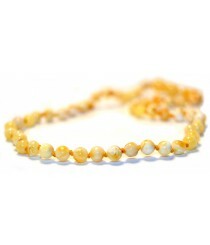 White color - plastic, small pieces - Natural Baltic Amber. 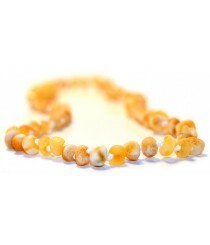 Product ID: BT19; Short Description: Tablet Amber Necklaces for Teething Babies; Style: Tablet; Length: ~32 cm (12.6 inches). 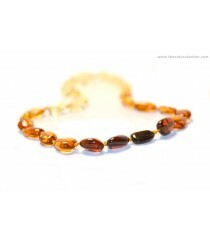 Cord: 100% Poliester String; Average Weight: ~8 g; Color: 2 Different Colors Combinations; Clasp: Screw; Colors: BT19-1 Multicolor;BT19-2 Cognac;BT19-3 Cherry;BT19-4 Green.